LOOKING for another SUV to add to your collection of wicked SUVs? Of course you’re not, in 2019 you’re looking for an SUV to do a job, a very specific job. That job is the stuff of legend, almost unattainable by car manufacturers the world over. Now before we tell you what the gig is, let’s start by telling you the 2019 Mitsubishi Outlander LS may hold the credentials to land this job. It may have ‘the right stuff’ to fulfil the role of the all-round family car. The car that everyone in your little brood likes. It’s a tough field of possible candidates though, and there’s plenty of them, more than 40 in fact. It’s a list that includes the Nissan QashQai, Holden Equinox, Ford Escape, Honda CR-V, BMW X3, Skoda Kodiaq and the Toyota RAV 4. But why is it so serious to find the car everyone likes? Well, let’s face it, cars have become more than just a thing that gets you from point A to point B or C, or even D. Just like a mobile phone, they’re an integral part of our lives. It’s important that it’s right. 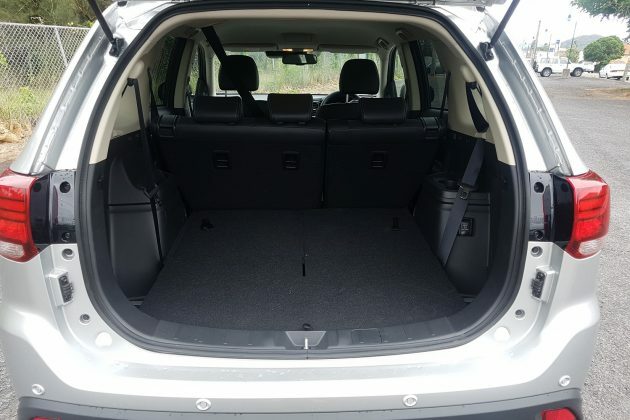 So does the 2019 Mitsubishi Outlander LS fit the bill? It’s got a decent history of reliability for starters. Let’s jump inside shall we and connect to all that goodness with Apple CarPlay and Android Auto as standard. Wait though, where’s the SatNav? 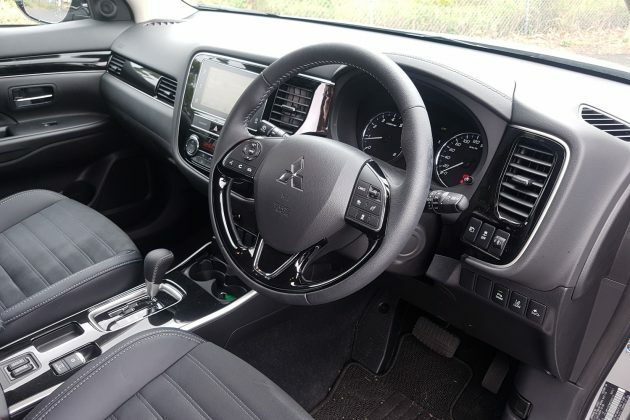 Cars without satellite navigation still frustrate the hell out of us, but that aside there is great functionality through the friendly user interface and the diagnostic features on offer are enough to please even the most tech minded of drivers. There are generous sound capabilities too, with a 6-speaker sound system that can drown out even the most persistent of back seat drivers. Other tech action includes cruise control, auto wipers and lights, and electric windows, mirrors and driver’s seat. There’s some heated bum action for both the bosses in the front and USB sockets for connection to the system and charging. There’s plenty of piano black and polished grey, and even a hint of chrome in the finishes too. Steering wheel controls are available for just about everything and well placed equipment makes you feel right at home. You won’t run out of storage either, there’s loads of it, including cup holders, bottle holders, a sun-glasses holder and a tonne of little nooks. You’ll find decent leg room in the front and second row, but as has come to be expected from the Outlander, the dicky seats in the back are reserved for small children or people you don’t like, as the leg room is limited in the seven seater. Luggage space when the sixth and seventh seats are in operation is pretty much null and void. You wouldn’t want to do a large family trip with this setup, unless you’ve got a pod on the roof or maybe a small trailer. On the outside, it’s got clean lines and a stylish looking body, it’s imposing but sophisticated, all at the same time. For the most part though, the look carries over from the previous model, with some minor tweaks. 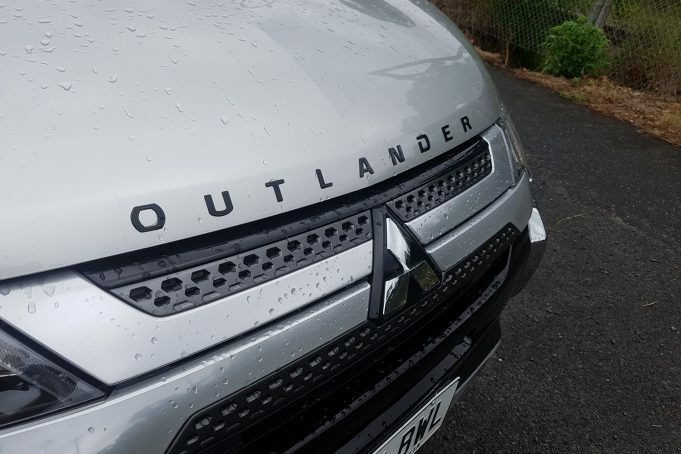 Optionally, you can have Outlander stamped across the front of the bonnet, reminiscent of a Range Rover or Land Rover, to add a feel of prestige. It’s got plenty of go too. 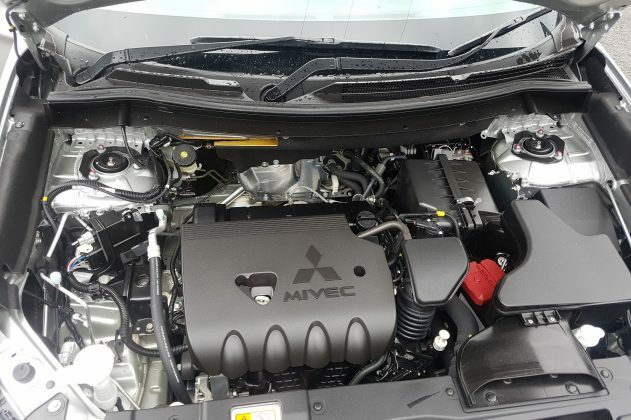 The 2019 Mitsubishi Outlander LS is powered by a 124kW 2.4-litre 4-cylinder petrol engine. The SOHC 16-valve MIVEC power plant pushes out 220Nm of torque through a CVT gearbox that is actually pretty good. It’s responsive when you demand it and doesn’t feel like you are committing a hate crime against the engine. Fuel efficiency is advertised as impressive 7.2-litres/100km and we managed a respectable 7.9-litres/100km during testing. The standard Macpherson strut coil over suspension in the front and multi-link in the back provides a solid platform too. Our 2WD LS variant rides on good looking 18-inch wheels, for solid feedback and a nice feel on the road, limiting the boat-like feel you get from some mid-sized SUVs. Your only problem might be which variant to choose if you don’t want the LS. There are 12 in all, starting with a base-model ES 5-seat manual, and running through to the LS Exceed, which is available in 2WD and AWD. Diesel is available too, adding an extra 140Nm of torque, and delivering solid towing power. 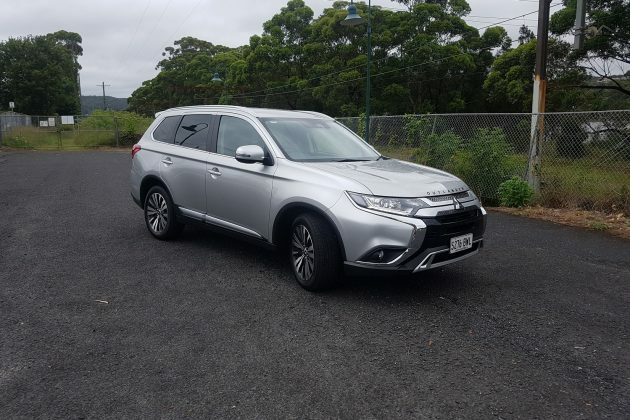 Prices start from $28,990 for the bottom of the range, and runs all the way up to $48,290 (drive away), but there’s also an optional Black Edition and the Outlander PHEV; a particular favourite of the team here at Exhaust Notes Australia. 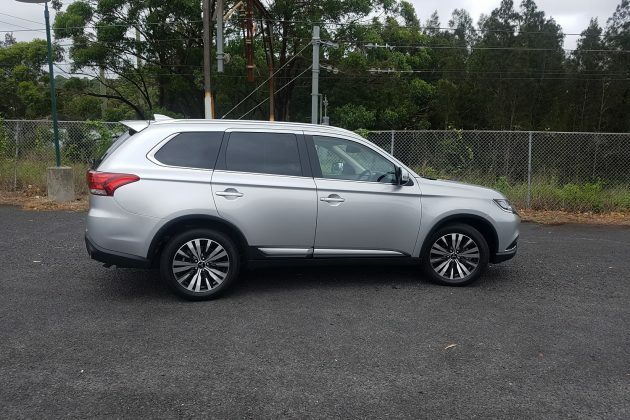 The 2019 Mitsubishi Outlander LS (2WD) comes with a 7-year/150,000km warranty, two years free scheduled servicing, and at the time of writing, includes $1,000 worth of free accessories. Overall though, it’s a fantastic all-round car that offers solid value for money and plenty of inclusions for the price. It’s a car the whole family will be happy to jump into and look after. 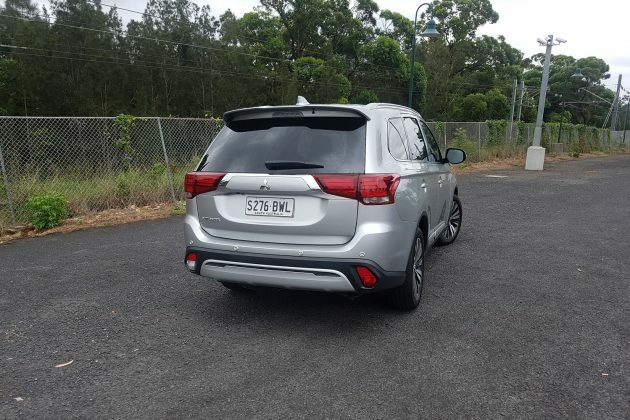 You could go nuts and spend $100,000 on a BMW X3 M40i that you won’t let anyone sit in, or budget down to a HAVAL H6 that you’ll trash, but the Outlander grabs respect, and that’s what makes it a great choice. 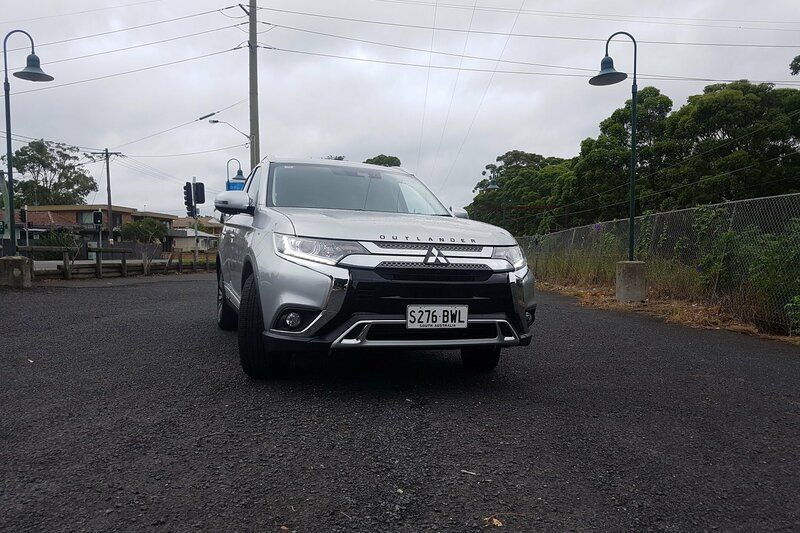 Our test vehicle was provided by Mitsubishi Australia. To find out more about the 2019 Outlander LS (2WD), contact your local Mitsubishi dealer. Pros - known quantity due to market longevity; efficient; comfy in the front and second rows. Cons - overall design starting to look old; way too many variants; third row seating.